What Is a Scrum Meeting? Skip-level meetings create an environment for upper-level management to meet with an employee without the interaction of the employee's direct supervisor. Skip-level meetings offer many benefits. Managers are able to see how employees are fitting within their departments and within the organization as a whole. The exclusion of direct supervisors allows management to make unbiased observations about employees. Managers prepare a set of questions to ask employees and take notes of employees' answers. Depending on how the skip level meeting went, managers may make suggestions to employees to improve work production and address any issues. Plan your meeting. Decide how long your meetings will last and what questions you plan to ask. Choose the schedules for your meeting. 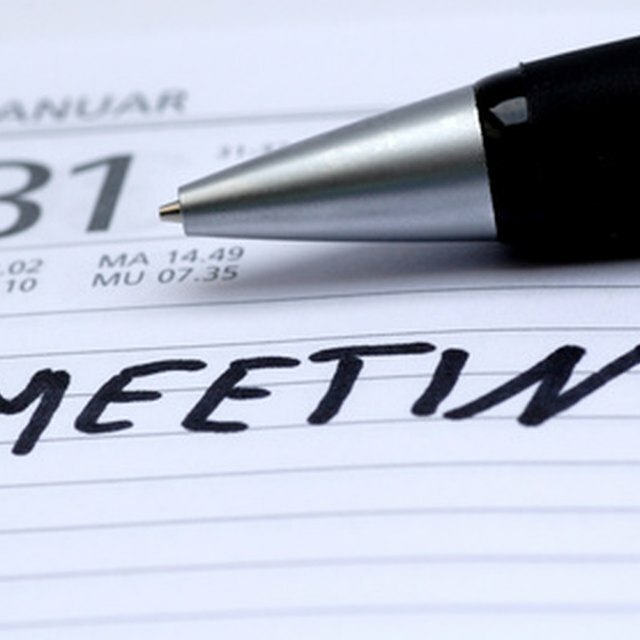 If your organization is large, you may have a more difficult time scheduling meetings. Send invitations to all employees you plan to meet. Email an copy of the invitation to each employee and require them to RSVP. You may also want to email the employee’s direct supervisor to make them aware of the meeting. Conduct the meetings. In the meetings, determine what your employees’ goals are, what work issues they may have and their interests outside of work. The purpose of the meeting is to get a feel of how employees fit within their team and to understand the day-to-day duties of employees. You should also record the meeting with an audio or video recording device to analyze the information from the meetings at a later date. What Are the Purposes of Quality Assurance Meetings? Give employees an anonymous feedback form at the conclusion of the meeting. Employees can feel intimidated in skip level meetings. Implementing an anonymous feedback form will build trust between management and employees by letting them know their opinions are valuable. Send thank-you emails to all employees you met. Include in the email your brief thoughts regarding the meeting. Inform employees that you will contact them shortly to discuss your thoughts in depth concerning the meeting and to offer suggestions and necessary changes. Review the information you collected during the meetings. Listen to the recorded meetings and gather important information from the meeting. Analyze information to see what improvements to make and what constructive criticism you can give employees. Create an action plan based on what you observed in the meeting and what you gathered from the collected feedback. Amend policies are make adjustments in areas within the organization that need improvement. Follow up with employees after action plans are implemented to see if improvements were made. Carefully plan your questions by researching the employee's background and work duties. Taking time to prepare questions will render thoughtful answers from employees that you can analyze later. Don't discuss issues with employees you have no intentions of correcting or improving. This will only create distrust.